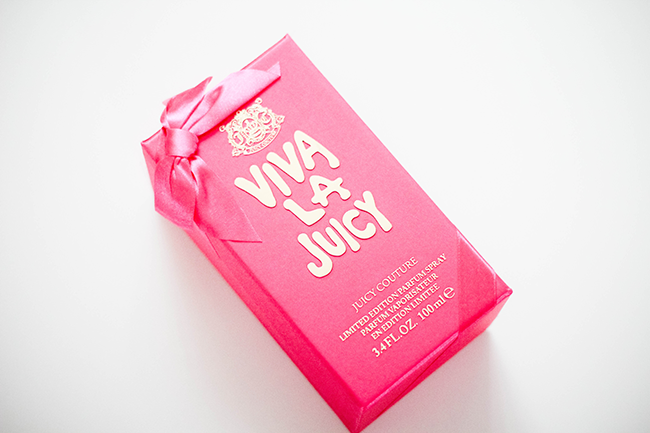 It's always nice to have a scent that lingers on the skin all day, Juicy Couture Viva la Juicy* has been one of those scents for me. 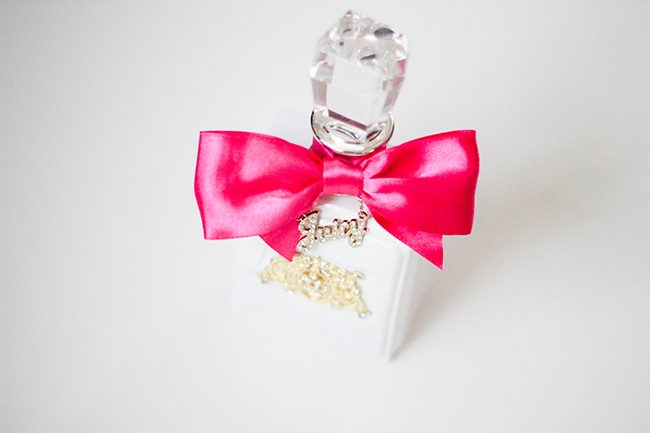 This limited edition parfum that's a Selfridges exclusive comes in a hot pink, bow decorated satin box with the traditional crown logo in gold on the front. I find the box alone makes this a gift. It is housed inside a box once opened with Juicy Couture written in gold in the top of the lid on a monochrome striped background. I never know whether to keep it inside this box or let it share a space with the rest of the the perfumes. 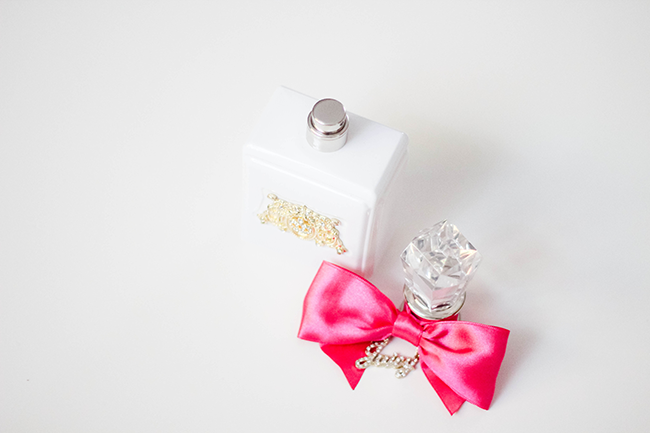 The bottle itself has a generous weight to it, a pure white enamel bottle with a gold logo plaque and a charm. What I think really catches the eye on this bottle after you get past the satin bow tied ribbon, is the clear, glass like topper. You can dress down the bottle or keep as is. Being this is my first experience with the Juicy Couture brand, I have to say this is a flirtatious perfume I'm happy to wear, fruity & sweet, I've had compliments and the best part about it is less is more. Will last a lot longer that way. The scent really comes alive with a few sprays and stays lingering around. I normally sometimes spray a bit on an item of clothing but I spray behind my knees, especially when wearing a dress/skirt as the smell travels upwards. A blend of some of my favourite notes are included such as mandarin, vanilla and sandalwood - automatically makes this a scent to have for any season. Is this something you'd love to see under your tree this Christmas? What beautiful presentation! I've never tried these fragrances before, I keep meaning to. I always wonder whether Juicy products are going to be too sweet for me. I'm more of a sandalwood, earthy girl with hints of feminine citrus scents but haven't really found much I like lately. I've been going through my fig fragrance like crazy and running dangerously low. Would it work for me Laa or would you say it's a little on the sweet side? It's the mandarin and sandalwood that's catching my eye here. Plus it would just look AMAZEBALLS on my vanity. I love this fragrance but at £85 its way to expensive for me.